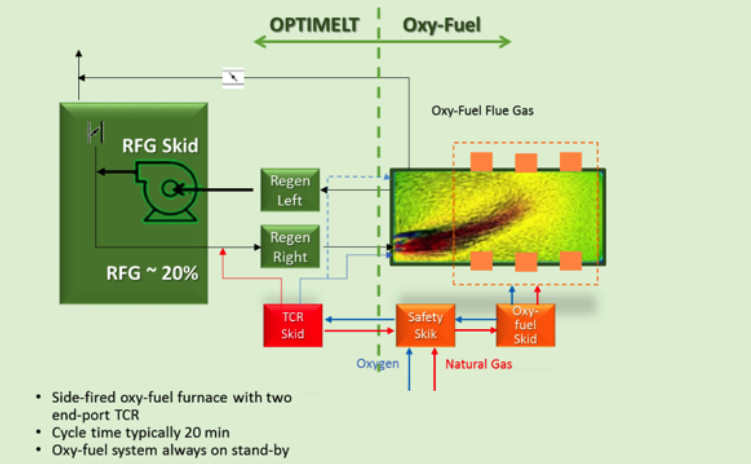 The OPTIMELT process profits from the high H2O and CO2 concentrations (~85% total) in the flue gas of oxy-fuel combustion and synergistically utilizes them as reactants for the endothermic reforming reactions. When a furnace is erected or retrofitted with the OPTIMELT system an oxy-fuel combustion system is either installed and is operational as a backup. Transitions between oxy-fuel operation and OPTIMELT operation are fully automated and only require the operator to initiate the process on the HMI (Human Machine Interface) control screen. To start up the OPTIMELT system from oxy-fuel combustion the control system gradually preheats the regenerators and closes the stack damper to divert more flue gas into the regenerators. At a certain temperature the oxy-fuel burners are shut down while the fuel, oxygen, and RFG (Recirculate Flue Gas) flows to the reforming regenerator and the syngas burner is ramped up. After a certain time the natural gas is shut off and the reforming regenerator is purged of syngas before the flow is reversed and the aforementioned heating side regenerator starts reforming. During the purging process it has been demonstrated to be advantageous to start up the oxy-fuel burners. This reduces the furnace pressure swing resulting from the OPTIMELT combustion system stopping and provides heat to the furnace during purging. The pressure distribution in an OPTIMELT chamber is similar to that in the conventional air heating regenerators. The top of the regenerator is typically in a range of +0.03 to +0.1 inch water column (0.8 to 2.5 mm w.c.) and the bottom of the regenerator is in a range of -0.2 to -0.3 inch water column (-5.1 to -7.6 mm w.c.). Since most of the regenerator chamber operates slightly below the ambient pressure, gas leak through chamber walls is in the flow direction of ambient air leaking into the chamber. Near the top of the regenerator the chamber pressure is slightly above the ambient pressure and gas leak through chamber walls is in the flow direction of syngas leaking out to the atmosphere. To prevent potential gas leaks into and out of the regenerator the exterior of the regenerator is encased in steel. In addition, CO monitors are placed near OPTIMELT chambers to warn of any potential syngas gas leaks with a wide safety margin. The same sensors control low/high Oxygen level in the surrounding atmosphere providing an extra level of safety. During the OPTIMELT implementation at Leerdam special effort was made to control the steel shell welds. Also special attention was placed during the heat up process to ensure no CO leaks during the OPTIMELT operational process. The OPTIMELT system at Leerdam site uses Oxygen generated through Praxair’s VPSA (Vacuum Pressure Swing Adsorption). The system uses molecular sieve adsorbent to separate the air components and produce a high purity Oxygen stream. The molecular sieve selectively adsorbs Nitrogen, Water, Carbon Dioxide and Hydrocarbon molecules while allowing the majority of the Oxygen and Argon molecules to pass through. Generated Oxygen is used at L1 furnace.